Thanks for all your input about healthier cooking–especially from those of you who have kids and understand that “healthy” is a relative term. Some days it’s a win when they agree to whole-grain Goldfish and not the chocolate ones mixed with marshmallows. If you’re like me, you have days when getting them to eat quinoa seems about as likely as them begging you for a nap. 1. Perhaps the best thing I did this year was found some friends who were also trying to eat healthier. We started a little baking co-op and swapped treats every Monday morning. Our kids are all in Kindergarten together, so each family made big batches of gluten-free (and kid-friendly) treats over the weekend. Swapping the goodies kept me experimenting with new recipes, and it was fun to try everyone else’s. Knowing my friends would eat the treats disciplined me to only bake gluten-free. And, of course, the kids loved helping and packaging up the baked goods for their friends. 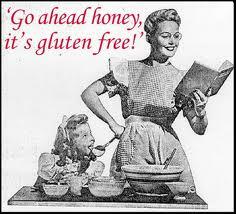 Perhaps the best part of all was that I saw gluten-free baking is hard for everyone–even those moms who hadn’t been using Betty Crocker cake mixes for the past couple decades. 2. Have we talked about Ghiradelli Chocolate Chips? We should. They are 60% cacao and not much sugar, but when I add them to our homemade waffles, pancakes, and muffins they work. By “work” I mean that when I add a handful of these, the kids gobble up platters of gluten-free, high-protein, high-fiber baked goods. The chips are magic–and so, so messy (as evidenced by the chocolate smears on the kids’ outfits each morning). Oh, well. A spoonful of dark chocolate…..
3. Baked bacon. So, yeah, yeah, who doesn’t love bacon, and yeah, yeah, even Claire’s has an ENTIRE DISPLAY dedicated to bacon earrings and bracelets–which is weird, right? But you know what I don’t love? Frying bacon. Because, oh my goodness, the babysitting and burning and splatters and so many more things I need to be doing more than checking on the needy bacon every couple minutes. Not to mention the yucky fry pan filled with a lake of grease. Then I tried baking the bacon, and I love the results. Crispy and straight AND you can throw away all the yucky grease with the aluminum foil lining the pan. The internet is filled with Baked Bacon enthusiasts, so just google their recipes. The gist is…Put your foil-lined sheet of bacon into a cold oven and turn it on to 400 degrees. Walk away and do something else. By the time your oven dings that it’s heated up, your bacon is just about baked. Pull it out and CRUNCH! Done. 4. Yesterday Amy mentioned the slow-cooker. Love to put a few chicken breasts in there with a jar of salsa and let it cook for six hours. We use this shredded chicken for snacking, soups, and in wraps. 5. And Tonja mentioned the smoothie, which we also love. The kids will drink all kinds of crazy-good-for-them stuff if it’s a. cold and b. sipped through a straw. I already fear what’ll happen when they meet the mimosa. 6. Some of my go-to gluten-free baking recipes are Nutella Brownies, Meringue Cookies, and this Almond Cake. A Gluten-Free, Sugar-Free Birthday Cake!